Denis Villeneuve has explored dark themes and big concepts in his previous works, from the grayness of renegade justice against accused child abusers in Prisoners to the necessary evils of combating Mexico's drug trade in Sicario, composing beautiful films with heavy, bleak substance. Arrival marks Villeneuve's first true foray into science-fiction, leaving one to ponder what might've drawn the director's complex outlook on the human condition to its story about figuring out how to talk with visitors from outer space, as well as the potential somberness that it might hold. While containing tough, incendiary reflections on the ways in which humans struggle to communicate amongst themselves in times of strife, there's a surprisingly uplifting and embraceable rhythm in Arrival's depiction of decoding an alien language that might be unexpected of the director, and it only deepens as this masterwork touches upon perceptions of how this mysterious universe of ours might actually work. From a distance, Villeneuve's film resembles the plot for an action/science-fiction blockbuster released during the summer two decades ago: without warning, a dozen large alien structures somewhat oval in shape and rocky in texture appear at scattered points across the globe. The world essentially comes to a standstill; the efforts of global governments haven't been able to make tangible communication with the aliens, despite the ships opening their doors to each of their vessels at evenly-spaced times across the world. With little progress under their belt and tensions running high, the American government -- spearheaded by affably commanding Colonel Weber (Forrest Whitaker) -- contacts gifted linguistics professor Dr. Louise Banks (Amy Adams) to help them understand their spoken and written language, supported by theoretical physicist Ian Donnelly (Jeremy Renner). The enormity of the job ahead of them, both the complications of the alien vocabulary and the world's impatience, begins to have an impact on Louise, recalibrating her perceptions as she scrambles to quell insecurities over their intentions. That's not where Arrival begins, though. At first, it depicts a sequence of heartrending events involving Louise and her ailing daughter, who gradually succumbs to an undisclosed but visually identifiable disease. With the somber, eloquent strings of Max Reicht's "On the Nature of Daylight" playing in the background, Villeneuve immediately conveys the tone of Louise's character through this stretch of footage, culminating in a beautiful display of heartbreak propelled by sparse dialogue and contemplative narration. As the film moves into the early moments of the aliens' contact, heralded by text-message tones echoing in her near-empty classroom and the unnerving rattle of overflying aircraft, we've already endured the rigors of hardship with this woman, yet it's unclear at first how those experiences will -- if they will -- become meaningful in the trials ahead of her. Will this prove to be poignant, yet somewhat stereotypical maternal character building for the woman tasked with bridging communication barriers, or will it manifest into something bigger? Preserving that curiosity, these memories of her daughter's life flutter through Louise's consciousness while she begins her trials in decoding the aliens' speech. 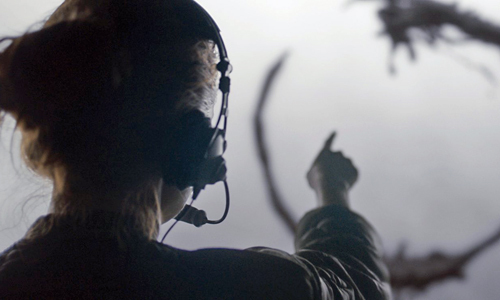 As she and her team vault up the spacecraft and position themselves in front of the large, ambiguous seven-legged beings -- dubbed Heptapods -- Arrival preserves the mentality and scope of independent science-fiction cinema, lingering either in the dark rectangular conference space aboard the aliens' ship or the cramped maze of military command rooms and decontamination zones on the ground. Grandness and awestruck wonder surround them, sure, as Louise and Ian stand before towering creatures whose tentacles flow about the space and eject inky circles into the air, all of which happens within monolithic pebble-shaped vessels positioned against global landscapes. But this Hollywood-crafted wizardry isn't concerned with the machinations of other blockbusters: instead, it merely boosts the legitimacy of the scholarly against-the-clock suspense that evolves over dry-erase boards, ciphering software, and debates over the meaning and interpretation of words. 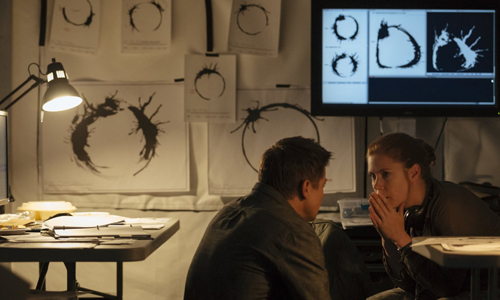 Guided by a beautifully somber performance from Amy Adams as Louise that's propped up by Jeremy Renner's genuine quirkiness as her physicist partner, Arrival stays relatively grounded in its thoughtful and immediate portrayal of getting lost in translation, both with travelers from outer space and amongst other human civilizations. The story, based off Ted Chiang's short fiction "The Story of Your Life", undergoes numerous evolutions in the tensions surrounding the visitors' vague objectives, yet this is a conscientious narrative that doesn't make threats, pull triggers or unleash bombs without authentic consideration of the repercussions. The ways in which the scientists use their methodology to figure out the truly alien method of communication becomes a coherent and engaging sci-fi mystery that unravels around real-world tensions, surrounded by a kind of pragmatic world-building and intellectual whimsy that's cut from the same cloth as the works of legendary genre writer Arthur C. Clarke. Director Villeneuve allows the enigmas of the situation to be savored by both the scientists and the audience, respecting the enormity and never seeming like Louise's efforts are just a means to some narrative end. That being said, Arrival doesn't shy away from the outlandish, either, as Villeneuve progressively moves away from a quasi-realistic depiction of alien contact to strengthen the story's more allegorical musings about the limits of our perception and the necessity of cooperation. The far-fetched nature of the story's twists and revelations are outweighed by the evocative power of its glimpse into the cosmos and expressiveness about the value of humanity and time itself, masterfully reflecting upon the mournful tone and intentions of that opening sequence. Through the challenges thrown at Louise during her mentally demanding trek, Arrival asks some hefty philosophical questions of both the linguist and of the audience, resulting in a sobering culmination of the many riddles surrounding her experiences and the Heptapods' language. The answers she provides -- along with the repercussions of her choices -- help translate this story into one of the most soulful and thought-provoking pieces of science-fiction to land on the big screen in years.